The Falcon Huntress is 5 reels and 9 paylines video slot powered by ThunderKick software. Total coin sizes are 10. This slot can be playable at various devices including mobile, desktop and tablet for a starting 10p per spin to up to £100. The slot offers a jackpot of 10,000 times of your total stake and there are 2 bonus rounds in this game. The first bonus is free spin bonus feature which will offer you 10 to up to 20 free spins after activation and up to 1x of multiplier. This is a Mongolian themed slot game which offers randomly triggered expanding symbols and they will form a great winning combination for you. As the name suggests, this game is based on falcon huntress. The reels of the game is being set against a backdrop of a temple and contains symbols like A, K, Q, J and 10 playing cards. You will also find symbols like falcon eggs and Ayak baus. 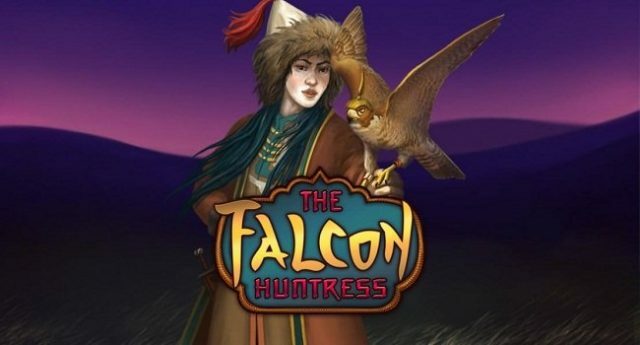 The Falcon Huntress symbol is the most lucrative symbol of this game which would offer you 1.5,10,50 and 500 times of your total stake if you land 2, 3, 4 and 5 of these symbols across a payline. Play this slot for fun or for real money at any Thunderkick casino. Another important symbol of the game is “golden falcon” which acts as the wild symbols as well. 3 of these wild symbols will give you 2 times of your total stake,4 wilds will offer you 20 times and 5 wilds across a payline will offer 200 times. The Bonus symbol is the scatter and 3 bonus symbols will offer you 10 free spins. You can receive another 10 free spins during this feature and it means a total of up to 20 free spins can be taken from the game.